Since it was obviously working, I continued to do what I was doing: go to meetings, communicate with my sponsor, read the A.A. literature, etc. Sometimes, I thought about drinking again, but what made me not do it was the fact that I was beginning to love my new life of sobriety. For one of the first times in my life, I felt like I was in control. I was no longer living under the dictatorship of alcohol, and it felt great. After almost a month of sobriety, I began to feel a strong foundation beginning to be built that would eventually improve all the areas of my life that my alcoholism had stagnated. I began to feel myself growing again: mentally, spiritually, emotionally, physically. My relationships began to improve because my friends and family could see that I was becoming honest with myself and doing everything within my power to get my life together. The A.A. literature helped me get through the cravings. Whenever I had alcohol cravings, I would remember the things I learned in A.A. about how an alcoholic's drinking actually gets worse after they've had some sobriety time and decide drink again. I had heard so many people share about how when an alcoholic relapses, there is something that happens to them physically and mentally that causes them to pick up where they left off at in their drinking. I heard one person say that after you've took the steps to get sober, and you drink again, you instantly realize what you just gave up; And I didn't want to give up what I had worked so hard for. 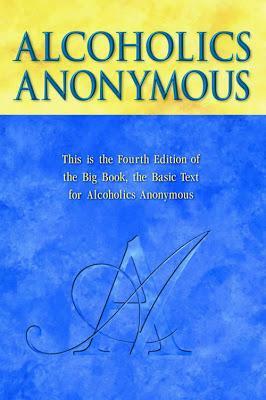 Many of the stories in the A.A. literature also consisted of people who had gotten sober, but eventually got to a point where they thought they could handle a drink. All of them said to themselves that they would just have one, or a couple, or they would just get buzzed and not go overboard. But every story ended with them eventually not being able to control it and it actually becoming worse than what it had been before. All of these things began to kick in whenever I though about drinking again. I knew it would be no different for me if I decided to go back out and drink again, so I didn't even try to fool myself. This was one of the first times I was facing reality and could see things for what they truly were and that was one thing I could see as clear as day. I had enough respect for the disease to do everything I could to stay sober. There were other times when I thought that with the education I had gained in A.A. about the disease of alcoholism, I wouldn't dare let my drinking get as bad as it had gotten in the past. But when I really thought about it, that was actually another reason for me not to drink - A.A. labeled alcoholism as a disease. 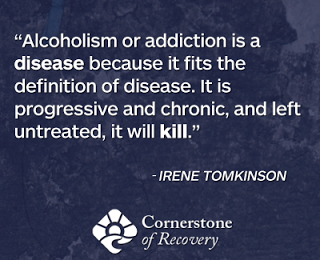 The late educator and author Irene Tomkinson went so far as to say, "Alcoholism or addiction is a disease because it fits the definition of disease. It is progressive and chronic, and left untreated, it will kill." When I learned this, it made me think about when I had almost died on my bathroom floor. The events that occurred before that incident met Thomkinson's definition of alcoholism being a disease to a T. My alcoholism had progressed, month-by-month, to where I was eventually drinking fifths by the day. As it had also been left untreated, ultimately, it almost killed me. The thought of me drinking again and it getting worse than that literally scared me. I have grown to have enough respect for the disease to not play games with it by trying to drink again because for me, it may prove to be the difference between life and death. He was right. The weeks turned into months. I continued to work hard to maintain my sobriety and eventually got 30 days sober. My A.A. home group (I called it my home group because I did service work there every week and I was a member of their trusted servants group) rewarded me by giving me a 1-month recovery token. During the meeting, the chairman first asked if there was anyone celebrating an anniversary today. I stood up and said I had 30 days clean today. The A.A. members in attendance applauded and then asked me how I did it. I told them I did it by getting honest with myself and admitting I was an alcoholic, coming to meetings, listening, sharing from the heart and getting a sponsor. I also told them that God was doing for me what I couldn't do for myself. During that time, as recommended by my sponsor, I was praying every morning and every night. I would pray and thank God for waking me up every morning. I would then ask Him to lead, guide and direct me and to keep me sober for the day. At night, I would thank Him for keeping me sober for the day (and I might say some more stuff). My home group then decided that it would be a good idea if I chaired the meeting. I had done all of the responsibilities at the meeting except that one. I ended up chairing the meeting for a month and during that same time I got 90 days clean! A few months passed and I had 6 months clean. It was getting to the point where I didn't even think about drinking anymore. I was working the steps of the program and going to at A.A. regularly. I was meeting every guideline of my probation since I didn't have to dodge testing anymore. My mother and step-father took me to drug/alcohol testing and were very happy and proud of my progress. I had also made amends with most of my family and friends. They were happy for me and hoping that I could continue to stay sober. My sister even let me come back to her apartment and watch her pets while she was out of town. She went to Atlanta to celebrate new years and I stayed at her place while she was gone. I just watched TV and played video games for the most part, but the closer it got to the new year, the more my mind and body began to crave alcohol. It was crazy because at that time every year, for at least the last 7 or 8 years, my body was used to having alcohol in it. On top of that, I was watching TV and I saw people drinking on the news while at Times Square in New York City. I started feeling bad because they were having so much fun and I was sitting at my sister's place by myself watching animals. I thought about what my friends might be doing and most of them were hanging out partying too. I wanted to have fun too. I wanted to do some celebrating. Especially since I had worked so hard to get clean in the latter half of the year. I was still learning how to have fun sober, but I knew I could have fun if I got some liquor. So I left my sister's apartment and started walking to the liquor store. I just stared at the liquor for about 5 minutes. I really didn't want to drink. I wasn't going to throw away 6 months clean just because it was new years. But it was like my body went into auto-pilot and just started walking toward the liquor store on its own. 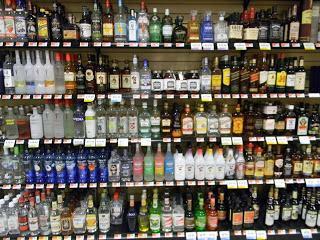 When I finally got there, I just stared at the shelves of alcohol. I didn't know what was wrong with me. I knew I couldn't drink because I was an alcoholic, but here I was at a liquor store just staring at the alcohol. After about 5 minutes, I left the store and started to walk back toward my sister's place. I was feeling a lot of different emotions, none of them good: weakness, confusion, addiction. I decided to resort to my A.A. resources and call my sponsor. I almost didn't know what to tell him because I was still trying to figure out what was going on myself. He answered, and I told him I had walked to the liquor store. I told him it was like my body went into auto-pilot because all of my friends were out having fun, when I watched TV people were having fun drinking for new years and I was used to drinking on new years every year for the last 7 or 8 years. I told him I felt like a mad man and that I may need some more counseling. My sponsor then told me exactly what I needed to hear. He reassured me - like the A.A. literature states - that alcohol is cunning, baffling and powerful! He recommended I just focus on not drinking for the rest of the day because in A.A., the motto is to "Take it one day at a time." He asked me if I wanted him to pray for me over the phone so he can ask God to help me get through the day. I told him that was okay. I didn't need prayer at the time. I just needed to talk to another alcoholic who knew the program and could tell me what was wrong with me at the time. What was wrong with me was the fact that I was an alcoholic and was dealing with a substance that was cunning, baffling and powerful. I'm glad my sponsor was able to reassure me that because for that short period of time, I had forgot. I walked back to my sister's apartment and went to sleep. I woke up the next morning, January 1st, 2011, feeling like a million bucks!